Robby and I recently ran our first 5k! Well, the first 5k we’ve run together (we’ve each done them separately). We’ve been trying to jog together in the mornings, and a few months ago we started pushing ourselves to run the 3-mile track at the Rose Bowl. When we realized we could run the whole thing without stopping, we decided to seek out a local 5k. 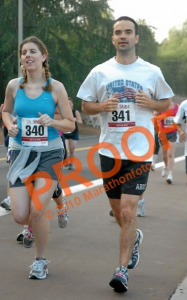 We discovered that Pasadena City College was holding a 5k charity race at the Rose Bowl in July, so we signed up. At 6am (ugh) on July 13, we pulled ourselves out of bed, laced up our running shoes, and hit the pavement. Here we are, after mile 1! It had been a few weeks since we’d run that far (so much for training! ), so the race was a bit of a challenge. Despite snapping at each other a few times when one of us was running too fast, we managed to stay together and cross the finish line without walking at a semi-respectable 32:20 time.